Gov. Kenneth Mapp vetoed a bill this week that would have allowed tax breaks to be extended for 10 additional years without the approval of the Economic Development Commission nor the chief executive. Mapp also vetoed a bill cutting gross receipts taxes for doctors in half and another bill creating an unfunded position of government curator and a new commission to oversee it. Mapp said the EDC bill purports to grant the commission more autonomy, but instead loosens the requirements for renewing tax benefits. He said it is “dangerous and concerning” that the bill proposes would automatically grant 10 year extensions of benefits without public hearings, a recommendation from the EDC or approval of the governor. “My friends, we do not want to do this,” Mapp said in his letter to Senate President Myron Jackson. Mapp also objected to a section of the bill letting EDC applicants to apply the tax benefits granted to a date of its choosing even if the applicant does not have a business license in place and regardless whether the applicant has paid its taxes or other fees to the government. “This means incomplete applications would qualify for tax exemptions on the date they are filed, notwithstanding the applicant’s willingness or failure to provide full information to the EDC,” Mapp wrote. The bill was approved in session April 4 after Sen. Kurt Vialet (D-STX) moved to put the bill on the agenda, bypassing the hearing process and any testimony for or against the measure. It was approved with two amendments, with little discussion of the merits. It would have removed the governor from approving, renewing or denying benefits and from the process of hiring the EDC’s director and assistant director. It also would have exempted international financial services from most oversight and moves approval of tax breaks for them from the EDC to the Banking Board, which Mapp also criticized. “How would you rate the granting of tax exemption benefits by the RT Park?” Mapp asked in his letter, suggesting the RT Park has not been as responsible as the EDC in overseeing its tax breaks. “Who has received benefits? How many employees are employed in the Virgin Islands by these beneficiaries? What is the annual value of tax revenues exempted by the RT Park annually?” Mapp asked, highlighting that much of this information is not available even to the governor. “Let the administration of tax exemption benefits remain within the Economic Development Authority,” Mapp concluded. Mapp also vetoed Bill No. 32-0147, which primarily relates to the practice of telemedicine. He said he he supported residents’ expanded access to telemedicine, but the bill before him had major flaws including reducing gross receipt taxes for some physicians from 5 to 2.5 percent. 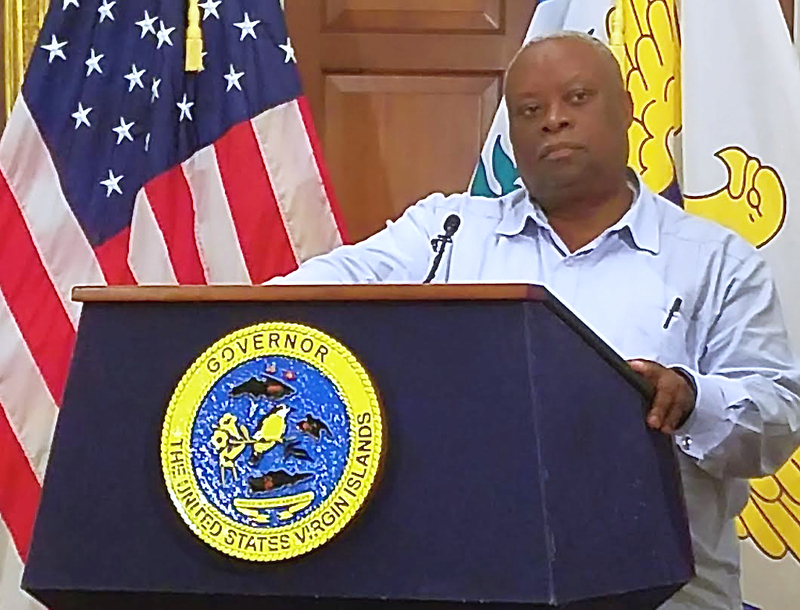 Governor Mapp said the territory could not justify diminishing its revenue base while at the same time drawing down on much needed funds from the territory’s recently authorized Community Disaster Loan. “How do we continue to justify accessing these funds while at the same time reducing our revenue base?” Mapp said. He went on to say the territory has been working to reassure bond holders their bonds, secured by gross receipts taxes, are safe and secure. And his administration is trying to persuade the federal government to let it draw more funds. Also, administering the changes would be a “nightmare” for the Internal Revenue Bureau, he said. Finally, Mapp vetoed a bill mandating the government hire a professional curator to manage millions of dollars in artwork and antiquities at Government House on St. Thomas. The measure, sponsored by Senate President Myron Jackson, also would have created a new committee to oversee the curating of those artifacts. While Jackson proposed the measure in 2016, it became more urgent after the hurricanes of Septemner, when it was discovered that the Government House building on St. Thomas lay unlocked and moldering for several months. The V.I. Government has assured media and senators that the art, including multi-million dollar paintings by Pissaro, is secure. But it refuses to let media see or know where the objects are being held, or even provide a list of the artifacts. Mapp said he agrees with cataloging and preserving cultural resources and has hired a chief conservator to inventory, oversee and care for the antiques and works of art. But he said the bill was unfunded, duplicative and needlessly creates a new commission. “Why does a curator need to be supervised and managed by eight persons?” Mapp said in his letter.